There Are No English Instructions Included In This Kit. Professional Installation Is Highly Recommended! Working table size is 310x90mm and the height of 76mm, including two working clamp. First of all thank you for purchasing the company's products, hoping to give you the work and life to bring greater convenience and endless fun! Before using the technology, please be sure to read this manual in detail, you must follow the instructions in the instructions required for safe operation. The multi-purpose table with bench drill can be used as a milling machine to achieve high precision coordinate drilling and small milling. Note: The above data unit is mm Please check the product packaging is intact, open the package, the mini multi-purpose table placed on the flat table (according to (Figure 1) first familiar with the important components of the table (6300 example). Warning: Please do not overload the use, or prone to deformation, broken and other damage and dangerous accidents! [Installation] 1. 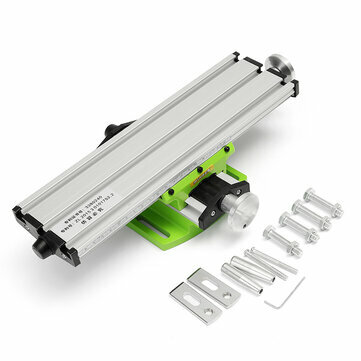 Installation of the fixed table The multi-purpose table for the use of small drill and drill stand design, the base with a screw mounting slot, just use the M8 screw nut can be fixed with the bench drill or drill bracket base. 1, set the scale on the hand wheel on the scale circle is rotatable, can be set to "0" bit to facilitate viewing, calculate the feed, in addition to the table is also equipped with a movable scale to adjust the axis. 2, adjust the guide clearance C6300 / 6330 models) before or after the initial use of long-term use, you must first check the gap between the dovetail and guide rails, if the multi-function table rail clearance is too large or too small, you need to adjust the screw (26), and then adjust the adjustment screw (27) to set the gap, and finally re-lock the nut. 3, timely lubrication and cleaning 6350 linear guide and linear bearings need Timely add lubricants, rails and screw to be cleaned in time. 4, the speed and processing of the processing of different materials of the workpiece should be different feeding speed and processing capacity. Overloading or excessive force is likely to cause damage to the workpiece, tool, and bench or table. 5, clamping the workpiece 6300: accessories with a punch of plywood, by adjusting the height of the top of the screw and the nut under the tightening of the nut to clamp the workpiece. (Figure 2) 6330,6350: Annex with a set of fine pliers, clamping the workpiece see (Figure 3) Figure 2 Figure 3 [different models of the characteristics and recommendations] BG-6300 basic multi-function table, Affordable, suitable for general use. Special Recommendation: BG-6350 with auxiliary motor bracket components, with the company's BG-3306 woodworking lathe Combined into a set of Buddha beads machine, Buddha beads of the production effect is very good!